Today Only! On the eve of her 68th birthday, fashion's most fun designer will host a one-day sample sale, offering 80 percent off apparel and 50 percent off accessories. Everybody gets a gift! The Millenium Broadway Hotel, 145 West 44th Street: August 6, 10am-8pm. It runs through the weekend, but if you know what's good for you, you'll go sooner rather than later (there will be apparel replenishments, but it's one-shot for shoes and bags). Prep with the Thread's continuous coverage and then get yourself down to Soho. 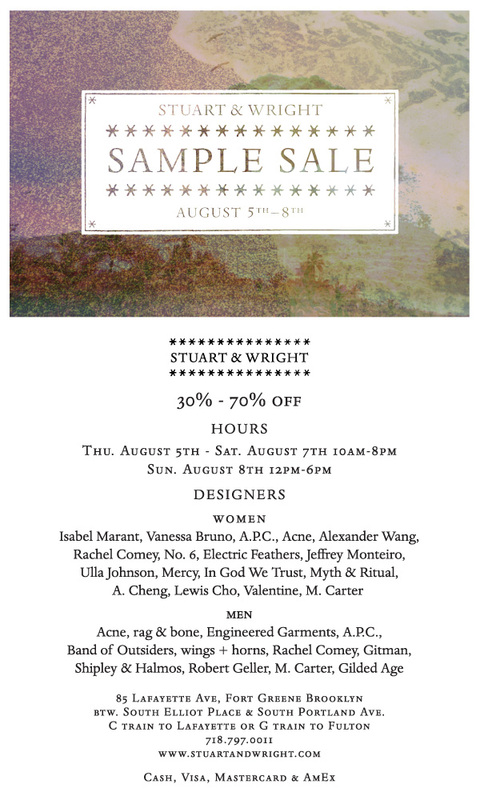 93 Mercer Street: Thursday, 2pm-7pm; Friday-Saturday, 10am-7pm; Sunday, 10am-4pm. Shop go-to items from Vanessa Bruno, Lewis Cho, Jeffrey Monteiro, Shipley & Halmos and more at 30 to 70 percent off. Sale items from the store's eponymous in-house label are up to 50 percent off. (Alas, online shop fans, you'll have to hoof it over for this one. E-commerce sale merch is temporarily off-line until the in-store sale ends.) We got an insider's take on four steals worth making the trip: APC. 's Indigo Stripe Cardigan Sweater, once $250, now $125; Rachel Comey's Cabin Dress, was $428, now $107; and Martin's Chiffon Print Tee, was $278, now $50. 85 Lafayette Avenue: Thursday-Saturday, 10AM-8PM; Sunday, noon-6PM. The boutique has moved to the basement for an end-of-season sale while they renovate upstairs. The expertly edited selection of under-the-radar designers and prime vintage will be reduced up to 70 percent. 6 Centre Market Place: Through Sunday, August 8.